Complete with all the wonder and magic that has entertained audiences for generations, this tale of Clara and her handsome nutcracker prince will come to life. Promptly following the December 11th & 18th matinee performances, join Clara and her friends in the Land of Sweets for a sweet treat and the opportunity to take a picture with the Artists. Clara's Candy Cane Caper tickets may be purchased online or at the show. CLICK HERE for information on purchasing tickets. 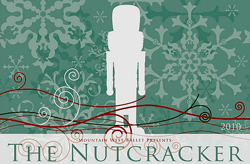 CLICK HERE to visit the Mountain West Ballet's website.